Music papers started to slag us off ... because [Sgt. Pepper] took five months to record, and I remember the great glee seeing in one of the papers how the Beatles have dried up ... and I was sitting rubbing my hands, saying "You just wait." "Strawberry Fields Forever" and "Penny Lane" were subsequently released as a double A-side in February 1967 after EMI and Epstein pressured Martin for a single. When it failed to reach number one in the UK, British press agencies speculated that the group's run of success might have ended, with headlines such as "Beatles Fail to Reach the Top", "First Time in Four Years" and "Has the Bubble Burst?" After its release, the childhood concept was abandoned in favour of Sgt. Pepper, and at Epstein's insistence the single tracks were not included on the LP. [nb 6] Martin later described the decision to drop these two songs as "the biggest mistake of my professional life". Nonetheless, in his judgment, "Strawberry Fields Forever", which he and the band spent an unprecedented 55 hours of studio time recording, "set the agenda for the whole album. "[nb 7] He explained: "It was going to be a record ... [with songs that] couldn't be performed live: they were designed to be studio productions and that was the difference. "[nb 8] McCartney's goal was to make the best Beatles album yet, declaring: "Now our performance is that record." Emerick recalls: "Because we knew that the Beatles wouldn't ever have to play the songs live, there were no creative boundaries." On 6 December 1966 the group began work on "When I'm Sixty-Four", the first track that would be included on the album. 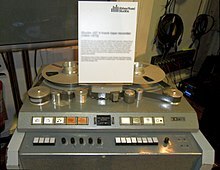 This Studer J37 four-track machine was used to record Sgt. Pepper. Sgt. Pepper was recorded using four-track equipment. Although eight-track tape recorders were available in the US, the first units were not operational in commercial studios in London until late 1967. [nb 9] As with previous Beatles albums, the Sgt. Pepper recordings made extensive use of the technique known as reduction mixing, in which one to four tracks from one recorder are mixed and dubbed down onto a master four-track machine, enabling the Abbey Road engineers to give the group a virtual multitrack studio. EMI's Studer J37 four-track machines were well suited to reduction mixing, as the high quality of the recordings that they produced minimised the increased noise associated with the process. Preferring to overdub his bass part last, McCartney tended to play other instruments when recording a song's backing track. This approach afforded him the extra time required to write and record melodic basslines that complemented the song's final arrangement. He also performed most of the album's lead guitar work. When recording the orchestra for "A Day in the Life", Martin synchronised a four-track recorder playing the Beatles' backing track to another one taping the orchestral overdub. The engineer Ken Townsend devised a method for accomplishing this by using a 50 Hz control signal between the two machines. A key feature of Sgt. Pepper is Martin and Emerick's liberal use of signal processing to shape the sound of the recording, which included the application of dynamic range compression,reverberation and signal limiting. Relatively new modular effects units were used, such as running voices and instruments through a Leslie speaker. Several innovative production techniques feature prominently on the recordings, including direct injection, pitch control and ambiophonics. Another is automatic double tracking (ADT), a system that uses tape recorders to create a simultaneous doubling of a sound. Although it had long been recognised that using multitrack tape to record doubled lead vocals produced an enhanced sound, before ADT it had been necessary to record such vocal tracks twice, a task that was both tedious and exacting. ADT was invented by Townsend during the Revolver sessions in 1966 especially for the Beatles, who disliked tracking sessions and regularly expressed a desire for a technical solution to the problem. The process soon became a common recording practice in popular music. Martin playfully explained to Lennon that his voice had been "treated with a double vibrocated sploshing flange ... It doubles your voice, John." Lennon realised that Martin was joking, but from that point on he referred to the effect as flanging, a label that was universally adopted by the music industry. Another important effect was varispeeding. Martin cites "Lucy in the Sky with Diamonds" as having the most variations of tape speed on Sgt. Pepper. During the recording of Lennon's vocals, the tape speed was reduced from 50 cycles per second to 45, which produced a higher and thinner-sounding track when played back at the normal speed. Listening to each stage of their recording, once they've done the first couple of tracks, it's often hard to see what they're still looking for, it sounds so complete. Often the final complicated, well-layered version seems to have drowned the initial simple melody. But they know it's not right, even if they can't put it into words. Their dedication is impressive, gnawing away at the same song for stretches of ten hours each. In an effort to get the right sound, the Beatles attempted numerous re-takes of "Getting Better". When the decision was made to re-record the basic track, Starr was summoned to the studio, but called off soon afterwards as the focus switched from rhythm to vocal tracking. Starr, who after the completion of his basic drum parts saw his participation limited to minor percussion overdubs, later lamented: "The biggest memory I have of Sgt. Pepper ... is I learned to play chess". For the album's title track, "Sgt. Pepper's Lonely Hearts Club Band", the recording of Starr's drum kit was enhanced by the use of damping and close-miking. The musicologist Ian MacDonald credits the new recording technique with creating a "three-dimensional" sound that – along with other Beatles innovations – engineers in the US would soon adopt as standard practice. McCartney played a grand piano on "A Day in the Life" and a Lowrey organ on "Lucy in the Sky with Diamonds", while Martin played a Hohner Pianet on "Getting Better", a harpsichord on "Fixing a Hole" and aharmonium on "Being for the Benefit of Mr. Kite!". Harrison used a tamboura on several tracks, including "Lucy in the Sky with Diamonds" and "Getting Better". The UK pressing of Sgt. Pepper was the first pop album to be mastered without rills, the momentary gaps that are typically placed between tracks as a point of demarcation. It made use of two crossfades that blended songs together, giving the impression of a continuous live performance. [nb 10] Although both stereo and monaural mixes of the album were prepared, the Beatles were minimally involved in what they regarded as the less important stereo mix sessions, leaving the task to Martin and Emerick. Emerick recalls: "We spent three weeks on the mono mixes and maybe three days on the stereo." He estimates that they spent 700 hours on the LP, more than 30 times that of the first Beatles album, Please Please Me, which cost £400 to produce. The final cost of Sgt. Pepper was approximately £25,000. The album was completed on 21 April 1967 with the recording of random noises, including a dog whistle that was included on the run-out groove.